The West Point Register of Graduates and Former Cadets is the WPAOG's oldest publication, dating back to 1850, when the first Register was compiled by George Cullum, Class of 1833. 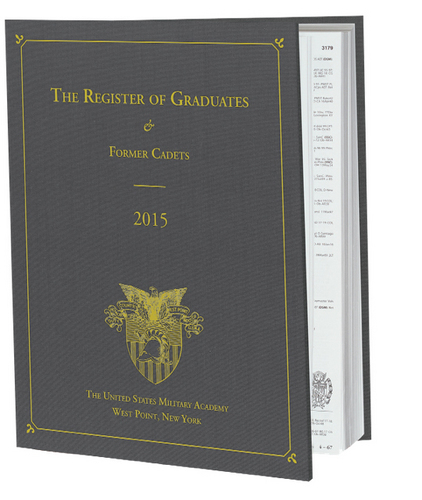 • More than 70,000 individual entries recording the names, classes and careers of every West Point graduate from 1802 to 2015. • The 2015 Edition (the most recent publication)is the 75th edition and features premium gray cloth binding embossed with gold foil, suitable for display in your office or home library. Over 1,200 pages. Date: July 6, 2016	What! No paperback edition! There should be a paperback version of the Register at a greatly reduced price!